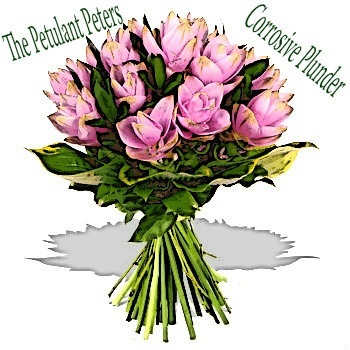 In 1987 The Petulant Peters release d their first album, You Are Soya Groovy, to little acclaim and fanfare. And deservedly so. It was an appalling slice of post-tumescent power-pop. It jiggled Colgate smiles and severed all connections to the periodic table’s high falutin’ gloss over roll over. Keyboards flushed away heartless parades and glass chinned guitars swaggered and staggered to the desktop recycle bin. The truculent four-piece went on hiatus. They worked real hard for real money before returning two years later with Corrosive Blunder. Once again to little acclaim and little fanfare. But this time it could not have been less deserved. This time the band took their cues from MC Lyte’s Cha Cha Cha, Madonna’s Like A Prayer and Les Baxter’s outré exotica and attached them to their tremulous guitar pop shock. The title track has been banished to the furthest reaches of a triumphant synaptic underworld. Simian Dancer is a testily considerate homage to Trinidadian calypso that practically begs to disappear into a thrice contested hole. The album closes with the thirty-minute epic, Oh Joe, Where Did You Put It?, a delightfully comprehensive overview of the reign of Charlemagne set to a curmudgeonly industrial waltz. Corrosive Blunder is a neglected nugget that lacks positional sense and cohesive logic but does stretch the limits of ferocious doublespeak.